Perry gave a speech at the rally in which he said,ng issue is that both Perry and the attendees of this rally only believe that one specific faith and specific family construct. Obviously, we believe that Texas values ALL faiths and ALL families. 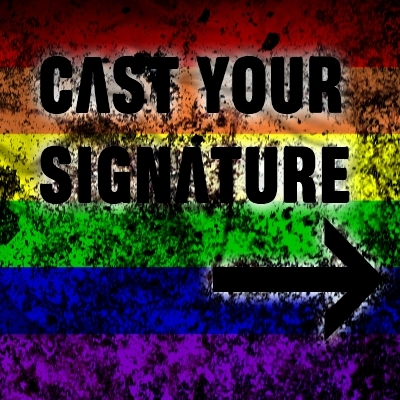 Sign our petition below urging Governor Perry to recant his statements against lesbian, gay, bisexual, and transgender Texans and to support equality for the LGBT community. Note: These petitions will be printed out and hand delivered directly to the Governor himself. We urge you to sign the petition no matter where you live but, please provide your zipcode in the box provided so that we can get an accurate count on the Texans that have signed! Urge Perry to support Equality! I heard you say, "the people of the state of Texas, myself included, believe that marriage is between one man and one woman". I am exasperated at this statement for many reasons. While it is true that 76% of voters voted to ban the freedom to marry in 2005, we must remember that that's only 76% of the 17.97% of registered voters that even bothered to show up to vote. That is not a majority of Texans. It's not even a majority of voters, but a minority of registered voters who bothered to show up and register their opinion in a special election. the fact is that the majority of Texans support the freedom to marry. You are representing the minority who wish to stand in the way of liberty and the pursuit of happiness for lesbian, gay, bisexual, and transgender Texans. The future of marriage in Texas is clear and you are currently standing on the wrong side of history! I urge you to recant your statement and do your job as Governor which is to protect ALL Texas families! I heard you say, “the people of the state of Texas, myself included, believe that marriage is between one man and one woman”. I am exasperated at this statement for many reasons. While it is true that 76% of voters voted to ban the freedom to marry in 2005, we must remember that that’s only 76% of the 17.97% of registered voters that even bothered to show up to vote. That is not a majority of Texans. It’s not even a majority of voters, but a minority of registered voters who bothered to show up and register their opinion in a special election.